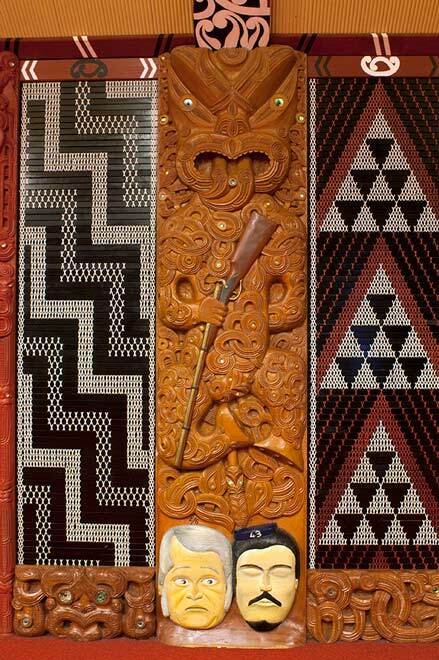 This pou (carved post) shows Tītokowaru holding a musket. Beneath his feet are the heads of Governor George Bowen (left) and Major Gustavus von Tempsky. Von Tempsky was killed by Tītokowaru's forces during a battle at Te Ngutu o te Manu, Taranaki. Governor Bowen put a price of 1,000 pounds on the head of Tītokowaru. Tītokowaru responded by placing a price of two-and-sixpence (25 cents) on Bowen's head.